Response: This study provides evidence that experienced musical improvisers categorize musical structures differently. 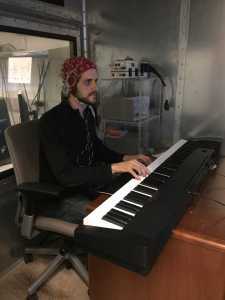 This difference would aid their ability to improvise because understanding how a set of exemplars of a particular musical chord are related would allow musicians to more fluently and efficiently recall them in a variety of musical situations (knowing more than one way to do something helps them improvise). Thus, it is possible to research the neuroscience of creativity without directly asking how people make up new things, although those questions are also important to ask. Also, we were not looking at a particular part of the brain, but rather a feature of the organization of knowledge of experienced improvisers. Finally, our study shows that the more experience you have, the more pronounced this effect is. This suggests that training is important in acquiring the ways of knowing that improvisers possess. However, we cannot rule out that other factors may influence how people categorize musical structures (it may not be musical training alone). Response: We have described one way in which experienced improvisers differ in their way of knowing about music, but there may very well be other ways to describe this. There is a lot of work that can be done to examine difference between musicians in how they think about music, in part dependent on how they learn music. This has implications for pedagogy, for a better understanding of creativity, and for understanding music cognition more generally. We have no disclosures to declare here. This entry was posted in Author Interviews, Columbia, Neurology and tagged brain science, creativity, medical research, music, neuroscience by Marie Benz MD FAAD. Bookmark the permalink.